Gulfcoast Legal Services cy pres Award Presentation - Law Office of Scott Johni, P.A. 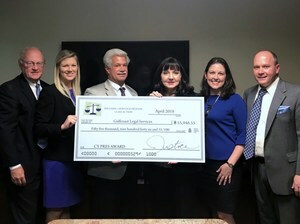 Johnilaw was honored to present a cy Pres award check to Gulfcoast Legal Services in the amount of $55,9465.55. These funds come as a result of 12 years of litigation on behalf of 65,000 Florida consumers. There was a favorable class action verdict against a state-wide propane company that unlawfully charged propane tank rent to its customers. Under cy pres, the court approved a charitable donation out of unclaimed funds. Gulfcoast Legal Services is a non-profit organization serving the civil legal needs of vulnerable individuals, families and communities. This organization was selected because it provides legal aid for utilities and consumer advocacy. Pictured are the local trial team attorneys Kent Whittemore and Erin Lohmiller, class representative Fred Williams, Gulfcoast representatives, and attorney Scott Johni.